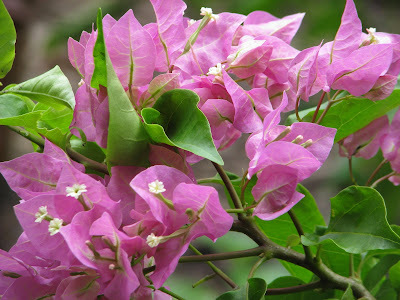 Another round of papery pinky-colored bracts has burst out on the potted up Bougainvillea that my mom (thanks again, Mom) gave me recently. The veggie garden is the only place where enough sun is shining to sprout its pretty colors. It will stay in a pot for now to keep it tame. 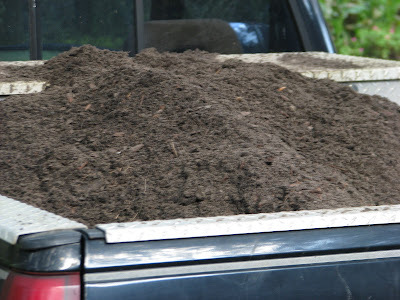 The exact minute a yard of fresh garden soil was dumped in the back of our pick-up I was looking forward to getting it spread. Before that moment I was sort-of lagging in enthusiasm but still going through the motions to stay on target with the planting calendar. Steam was rising from the warmth of it as it was poured early this morning. The awesome smell and feel of its earthy texture reminded me of cooler weather and a cooler harvest of veggies to be expected in a couple of months. 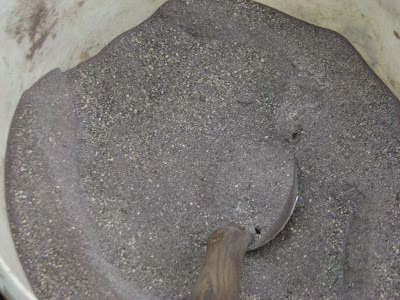 Mixed up in a 5 gallon bucket is dried blood and bone meal. Equal parts and stirred together with no particular scientific measuring involved. 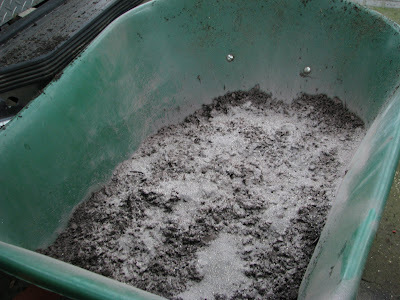 A few shovels full of dirt go into the wheelbarrow then a couple of scoops (trowel scoops) of the organic mixture. Then I finish filling the wheelbarrow with more dirt. 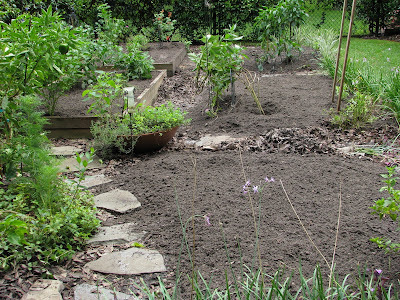 As it pours out onto the ground and gets spread evenly the amendments blend with the soil. 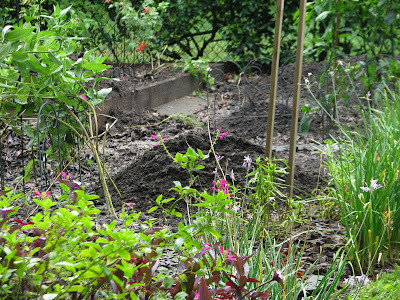 Spread out to add 4 or 5 inches of fresh dirt it will need to be left alone without planting for a couple of weeks. Rain applications will help to settle the organics into the soil making it ready for seed planting. This week I mustered up the courage to pull out most of the self-seeded salvia coccinea, blue porterweed, some scraggly but blooming marigolds, and I cut back all the purple Angelonia. There is one poorly sited zinnia patch left with buds all over it. 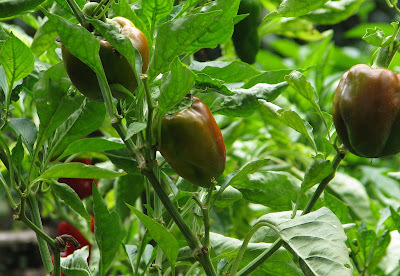 And, of course, the few sweet pepper plants that keep on giving me fruit... those things are tireless. I also left the border plants which were originally placed with thoughts of enjoying them from season to season... and I left a few blue porterweed ... for now anyway. In all of gardening I've found that sheer discipline is my best friend for completing some jobs. The rain was good to me this morning. I started very early but so did the thunder rumbling, cloudy skies. Rain threathened for a few hours while I worked under the welcomed cloud cover. Once the dirt was transferred and spread out in the beds in the veggie garden, I then spread a few carts-full onto my troubled front lawn grass, too. After sprinkles here and there all morning... the skies opened up to water in those organic materials into the garden just as I finished the last load of dirt. Then all my winter seeds were delivered today, too. 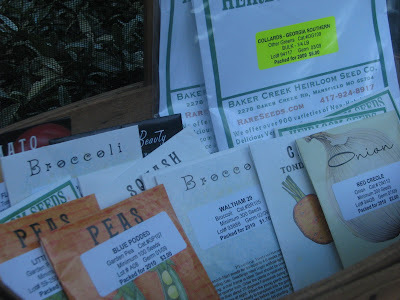 All heirloom seeds from Baker Creek Heirloom Seeds... more inspiration. What timing! As hot as it still is I'm beginning to recall how happy I was last year for planting a fall veggie garden. You are a busy beaver, Meems... Everything is just falling right into place for you. Now you can plant your winter seeds. WOW--I'm envious. I love after working in the yard for it to rain afterwards and water it all into the ground. It is always exciting to get seeds or plants in the mail. I have gotten my fair share of seeds recently with another order coming in this upcoming week. I of course don't grow veggies, but I am sure it is still the same feeling. if i wasn't so tired i would be so inspired but i think i am anyway. i am so excited for you to be getting your fall garden planted. seeing your dirt...seeds...important mixture...just maybe i can do it. we had a day today that felt like fall. a cool breeze in the air which is always good for getting a little burst of energy. so delighted for the timing of the blessed rain...it makes all the difference. Timing is everything and I look forward to seeing your progress and harvests. You set a good example. I wish more folks would get started but I can tell you by looking at garden center sales and empty aisles that they are not there yet. Late October is when most Floridians start to garden and that is why they buy so many gallon pots of blooming flowers and yes vegetables. All we can do is try and you are doing a great job at that. Hi Meems......what a lot of hardwork but so rewarding I am sure. Whew, just seeing all that dirt and seeds wore me out. Your garden will be full of yummy things in no time. Meems, I know what you mean~~"sheer discipline" is often the most necessary ingredient in gardening! Without it the mundane tasks would never get done. The same applies to household chores~~which tend to get neglected during the long growing seasons. Thank you! You've reminded me that the compost company hasn't called me to arrange a delivery! A lot of work Meems, but very rewarding. It all looks good. The rains can be so good on our gardens. You and me both. Seeds, plants, dirt gardeners just get excited about all of it. Saying the word fall and cool breeze in the air makes me want to head right up there. I am so ready for a change from the heat. I did my best to conjure up memories of our blissful fall/winter last year to get me going on that dirt project. You picked a good day to do your un-Thanksgiving dinner! It is understandable to wait until it 'feels' more like fall to be inspired. As you know, when starting from seed the timing is important. I'm learning a lot as I go and 'trying' is a huge part of it. Foxes are one element I don't have to worry about around here thank goodness. I will add a layer of my own compost to the dirt one day this week and then the seeds will be sown following. I sure hope so... yummy things keep me going. If only those household tasks could be put on hold while we garden... but somehow they continue to make demands as well. Sheer discipline can be very helpful in both places. I wish you the same great week. It's a lot of work to live in Florida. I do have some leaf mulch and cow manure spreading to be done---but not anymore plants to start. You'll be munching on yummy stuff when I'm roasting marshmallows. The dirt looks very healthy. I'm sure the garden will reward you for your hard work Meems! I just love it when it clouds up and rains at the right time. Baker Creek is awesome! Their selection is mind-boggling. I need to find more sunny space for veggies. Roast some for me... Ha. Don't you just have to love good, healthy dirt! I really appreciated the clouds as the morning passed. It was a nice shelter from the harsh sun over in that part of the garden. Usually I try to stay in the shady spots during the middle of the day. I'm looking forward to some yummy veggies since I haven't even been able to bring myself to buy store-bought green beans since my spring garden faded. Like you, I wish I had some more footage in the sun... for more seeds.